As a teacher himself, John understands the concept of continuing education to keep current with the ebb and flow in today's music, both in terms of artistic style and technology. 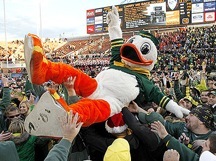 As an alum of the University of Oregon, he is most proud of the Duck's accomplishment in their first Rose Bowl victory since 1917. John has also become something of a fixture in the Music Department of Foothill College in Los Altos, CA. He continues his studies there in both technology and music history.